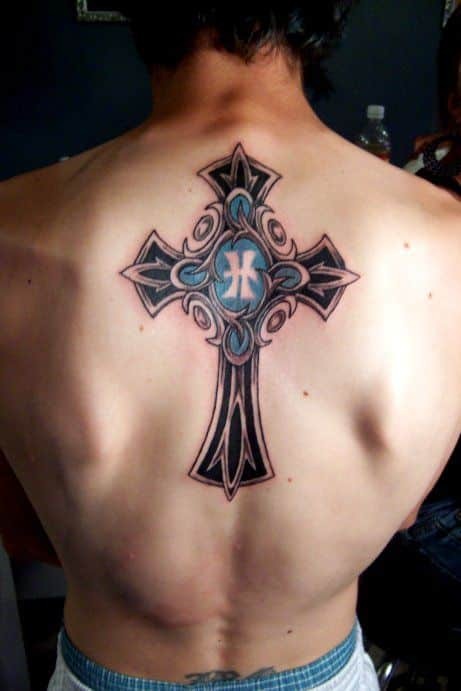 This cross tattoo sketch implies a classical, gothic, modern look altogether with extravagant curves, beveled sides and completely detailed edges. The cross is endowed with studs and linings all throughout the insides giving it a whole, individual meaning and exquisite appearance. A cross within a cross, the boundaries are set in solid black with sharp tips, and the inner drawing composed of ropes and chains that are invulnerable and cannot be broken. The loops are continuous and unending, parallel to its stunning design. 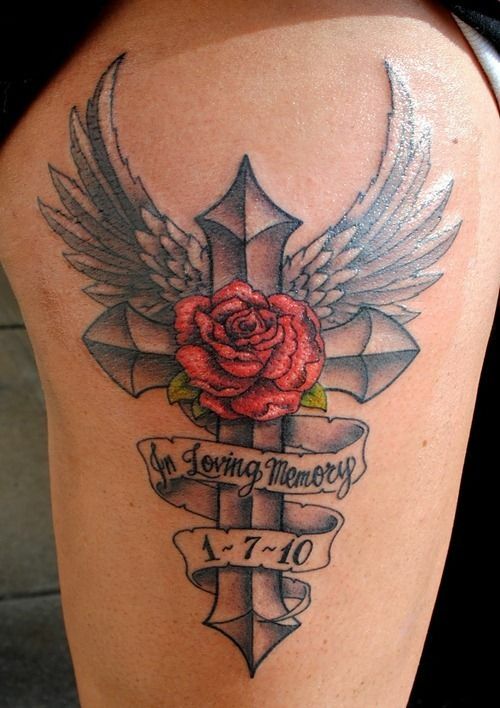 A significant red rose garlands the center of this cross, wrapped in dainty film containing meaningful words, such as honoring the memory of a loved one. The heavens bestow its glory in it with wings arched high above with glittering feathers outstretched behind the rose and cross tattoos. Two simple nails, short and long, tied together in opposite directions, make up one beautiful thing, a symbolic cross. It is stabbed into the skin causing trickles of blood, and eliciting a courageous air to the individual along with a strong physique and spirit. Modern and artistic, this cross is composed of shades of black and blue deeply applied in bold and brave hues. You can have your initials engraved right in the middle, within a circle of a defined, majestic frame, with delicate twists, loops and tangles all over the cross. 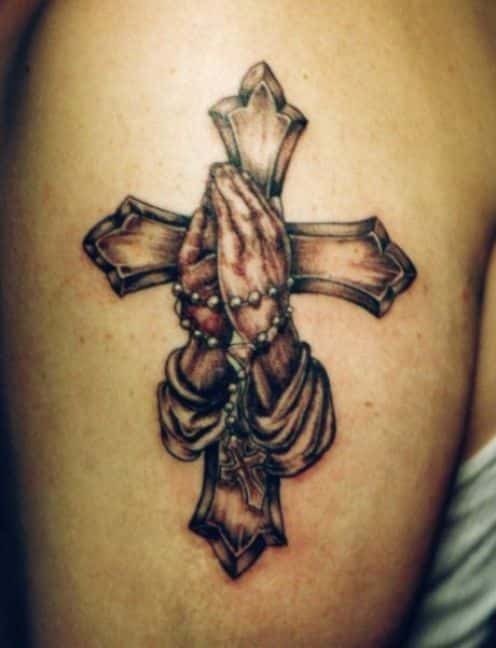 This is a prayerful tattoo that perfectly fits on the arm. The praying hands perfectly fit within the cross with the rosary nicely appearing entwined on the hand. 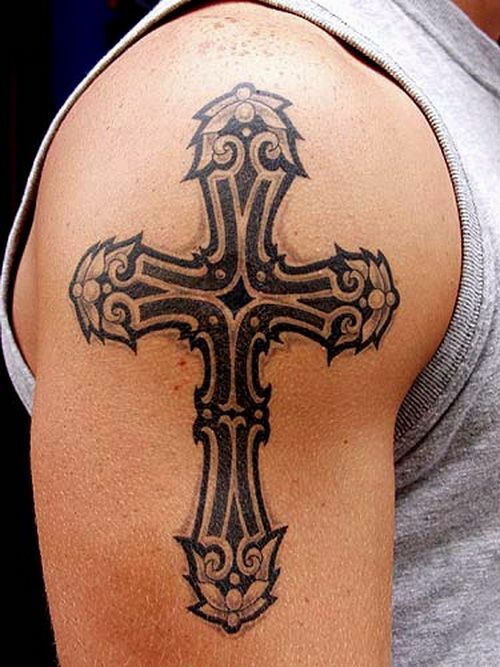 The tattoo is a symbolic prayer of a prayerful person who believes in Christianity. 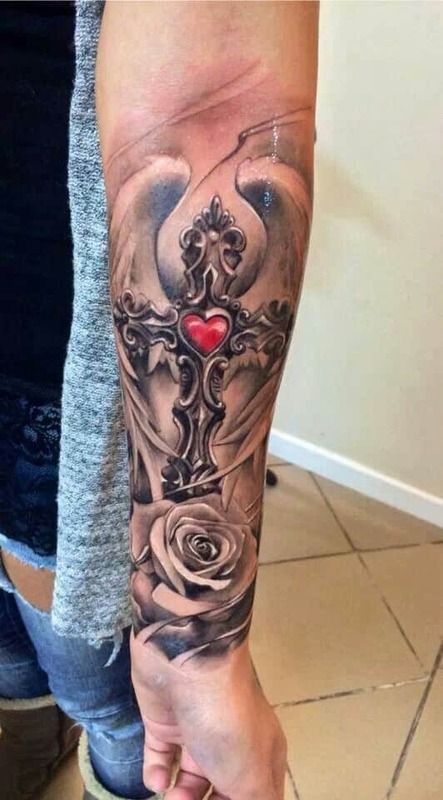 The cross tattoo symbolizes both love and fear with a symbol of heart shown in red and some scary eyes below the heart symbol. The cross is made in form of a creature with what appear to be horns at the top and flowers at the bottom. It appears nicely on the arm and people will always stare at you trying to understand it. 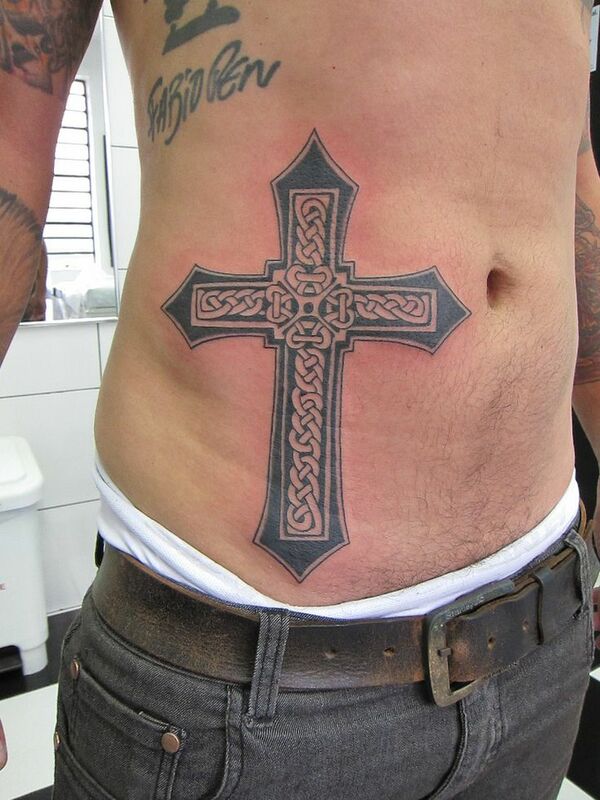 This cross tattoo idea on man’s back is nicely imprinted on the back and a great show for your believe in religion. The center of the cross has a circular drawing with another inner triangular drawing all meant to bring out the artistry work done. 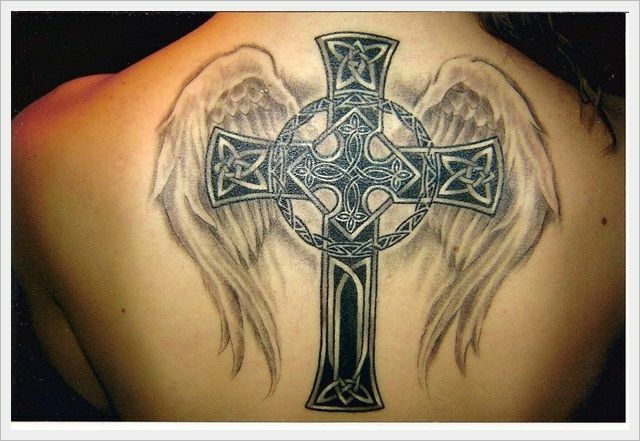 The tattoo is enclosed is some angelic wings from what is commonly seen in those biblical movies. 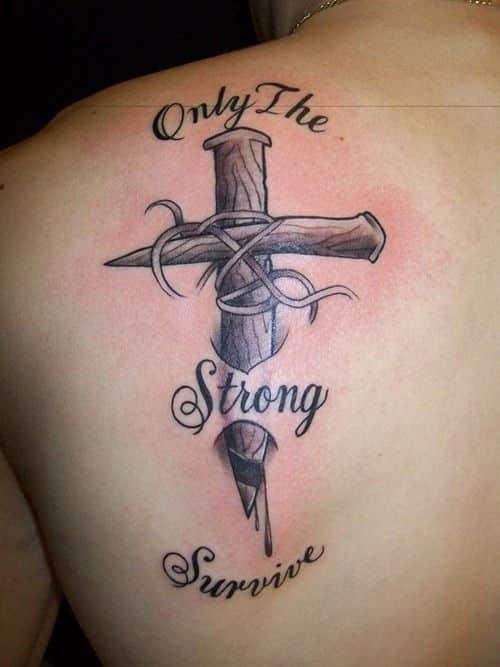 The cross is a symbol one with wings at the top showing your believe in God. 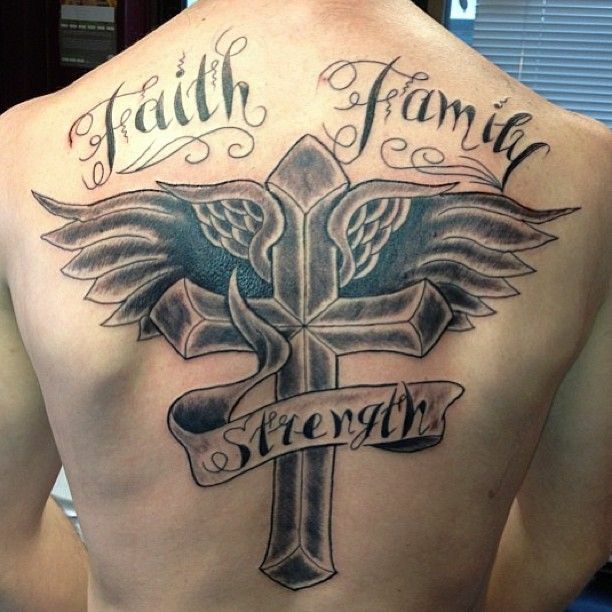 The words around the tattoo rhymes well with the cross as they show a firm believer in faith, family and the strength which are fundamentals for any Christian family. 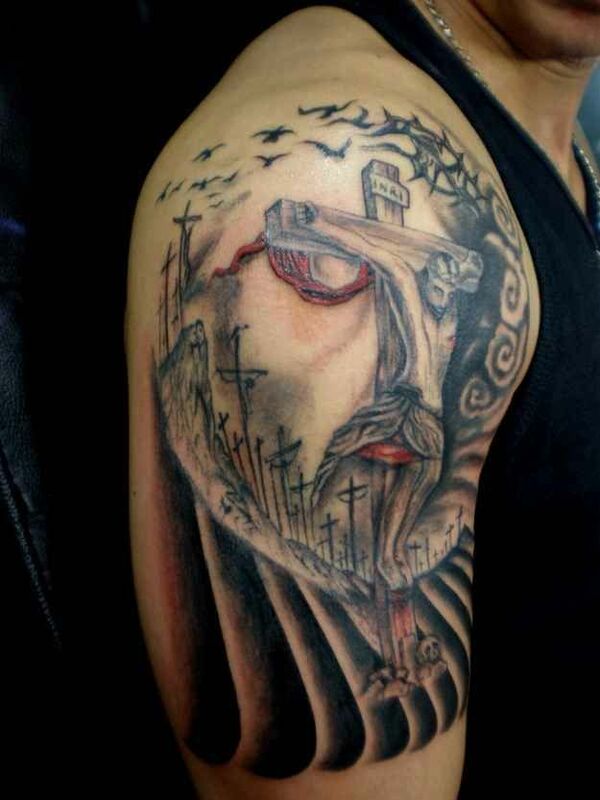 This one is a unique one with the head of Jesus Christ as we know from the Bible movies meant to fit nicely with the end of the arm. A cross is them imprinted at the center of the head to crossing the eyes and the nose. Smaller crosses around the head act as beards with thorns the wee put on the head of Jesus appearing at the top of the head.